Life isn't easy when you're a kid living among dinosaurs and other extinct prehistoric creatures. The environment is damp, treacherous, at times arid and dry, but mostly desolate and lacking in coconuts to quench one's thirst. And if we're speaking of an NES video game, leave it to Hudson Soft to present an adventure built around this premise, starring a boy in a neverending quest to keep his wastelands in peace. The style chosen is that of a pedestrian vertical shooter, and a particularly amusing one if you ask my opinion. Note: The Japanese version came out two years earlier under the name Shin Jinrui - The New Type. By taking control of Dino Riki, the unsung child hero of the game, players must initially face three stages filled with tough perils across a swamp area, a ruined desertic level and a fossil-laden mountain. For the 4th stage these themes return in shorter but harder versions along with a boss rush, with the last section based off the desert theme and ending with a monster fly as the ultimate final boss. The challenge is designed to put not only our shmupping dexterity to the test, but also our platforming skills. After all, in Adventures of Dino Riki jumping is as close to flying as honey is close to the beehive, and dealing with it is essential to surf a smooth learning curve, only with a little twist that might easily be taken for granted if players don't pay attention (read on). Dude, where's my pair of wings? Controls work with shot in button A and jump in button B. 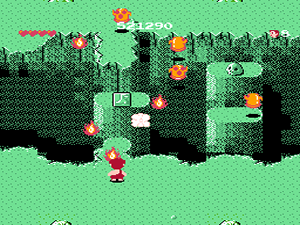 A very unusual input in a true scrolling shooter, the jump is there to allow Riki to reach platforms and get to the other side of lakes and ravines, as well as to avoid quicksand traps. Jumping other things such as bullets isn't encouraged at all, it will only register as a hit. Even though the game is checkpoint-based, Riki can take some damage before dying due to the health meter mechanic. The only way to bite the dust instantly is by falling into water, falling off a cliff, getting swallowed by quicksand, getting fried by giant flames or being rammed by skeleton lizards. In each level a characteristic ground block holds the items Riki needs to increase his chances at succeeding in his mission. These include boots (speed-up), heart (adds one more point to the health meter), meat-on-a-bone (recovers health), fist (power-up), diamonds (extra points) and star (a smart bomb that clears the screen of enemies). There are also hidden items uncovered if you shoot at their specific spots, and these can be either the bird, which grows a pair of wings on Riki's back and allows him to fly, or "macho Riki", an item that turns the character into an angrier version of himself who throws his own image at the enemies. 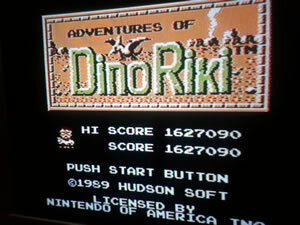 9 out of 10 people are sure to curse Adventures of Dino Riki due to its jump mechanic, which can very early on ruin their perception of the game. Granted, it's not easy to quickly get the timing right to land on those platforms or water-lilies under the pressure of the scrolling effect or the fact that you must move with them or you'll fall and die. There is, however, a nice little way to circumvent that during 95% of the game: the bird item mentioned above. Every single section bar a few short areas in the final level has a hidden bird for you to find and use to fly, so just take it, press the jump button once and only let it go if you want to land. Of course getting hit will trump you down and outright kill you if you're flying over a ravine or a water pond, but that's just another aspect of what makes the gameplay in this charming little title so unique. Since every hit degrades Riki's power and speed by one level, powering up to the fullest requires picking up three fists without getting hit. From those weak starting rocks our hero progresses to axes, boomerangs and torches. Even though the boomerangs aren't that bad, carrying the torch makes the game considerably easier so do your best to keep it at all times (one important thing to have in mind is that to better enjoy Adventures of Dino Riki you need a turbo controller – mashing buttons becomes extremely tiresome especially when you're not fully powered). Avoiding hits is also the secret to gain extra lives because all it takes is to continue collecting successive diamonds without receiving damage. According to the instruction manual you need six in a row, but most of the time it takes a little more than that. A brief observation about the scoring system: if Riki is fully powered subsequent fist icons work like the star, wiping out all enemies on screen; however, in the same vein of the grey capsules in Gradius, all enemies killed in this manner won't give you any points. I often don't dabble about endings in shmups, but the absolute lack of even a THE END panel in this game kinda hurts the lovely atmosphere of the package. Though humble in textures, the graphics and the enemy gallery are totally in tune with the prehistoric motif, along with nice music, fair hit detection (narrow platform thresholds notwithstanding) and great use of color (blue, yellow and green define the levels). The gameplay is based off characterisc enemy waves that succeed each other in a fixed order, as in a very relaxed variation of Star Force. In the long run that favors memorization, but regardless of your muscle memory capabilities the final stage of Dino Riki is no pushover, demanding quite a bit of effort to be conquered. And when the monster fly goes down the game just starts anew, with no reward whatsoever besides the realization Riki is doomed to forever patrol those barren landscapes. When I beat the game years ago I did it with no autofire, but this time around I used a turbo controller and I shamelessly admit I had more fun now. My new high score got a boost of 70% as I died my last life in the 2nd section of stage 3-4. Further loops come with a slightly higher bullet count and more resilient enemies; this last incremental change is what makes getting back up increasingly more difficult when you die. Great game, but how some people hide the secrets of the game, like the power of flying, I have certain restriction to this game. I can't read in japanese.